After this morning's ruling from Federal judge Henry Hudson, I took a closer look at him, since his ruling seemed to try to make a record for a valid challenge to existing case law on the constitutionality of the commerce clause. The right wing has long harbored the hope of stacking the Supreme Court with enough conservatives to overturn a huge body of existing case law established when the New Deal was passed, and this ruling plays right into it. A powerhouse Republican online communications firm, Campaign Solutions, has done work for a host of prominent Republican clients and health care reform critics, including the RNC and NRCC (both of which have called, to varying degrees, for health care reform's repeal). The president of the firm, Becki Donatelli, is the wife of longtime GOP hand Frank Donatelli, and is an adviser to former Alaska Gov. Sarah Palin, among others. Judge Hudson has owned stock in Campaign Solutions going back 13 years to the founding of the company or well before he became a federal judge. Since joining the federal bench, he has fully disclosed his stock ownership in the company. He is a passive investor only, has no knowledge of the day to day operations of the firm, and has never discussed any aspect of the business with any official of the company. Ah, but the Donatelli dynasty isn't simply limited to Campaign Solutions, which is basically a turnkey campaign creator. No, no. The Donatellis are the "go to" people for all sorts of Republican fun. Let's start with the Young America's Foundation. This is the non-profit organization for the Reagan Ranch in Santa Barbara. In addition to maintaining the ranch, the Young America's Foundation has training, literature and other good clean fun for indoctrinating America's youth in the ways of the Republican Party. Frank Donatelli is a director and the Secretary/Treasurer of the Young America's Foundation. (2008 Form 990 - PDF) The Foundation's President is Ron Robinson. Ron Robinson is a director of Citizens United. Then there is Donatelli Group, which includes Campaign Solutions, EDonation.com, and DonationReport.com, in addition to their PR/Direct Mail arm at ConnellDonatelli and Donatelli Avella. Donatelli Avella receives $15,000/month from GOPAC for management and political consulting. Of course, the Donatelli outfit is also closely linked to the Swiftboaters of 2004. Click that link for a list of some current clients, including...Young America's Foundation. Oh, and Citizens United. 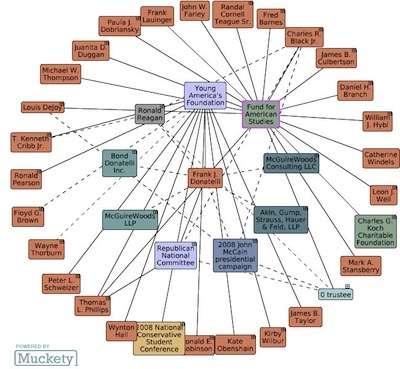 There's some pretty direct linkage between Frank and Rebecca Donatelli and the Koch family, the McCain campaign, and other Republican movers and shakers. Anyone who spends any time researching campaigns, campaign finance, and the Republican party learns right up front that nothing happens in the Republican party without a Donatelli having a hand in it somewhere. They are everywhere. So, to have a judge who is one of thirteen private investors in a firm which is one of the primary Republican movers and shakers and which has deep, strong connections to Citizens United, its affiliates and its directors is no small thing. It is a very, very big thing. People who invest money in small, closely held corporations aren't the kind who call up their broker and ask what the hot stock of the day is. They know the ones they're investing in very well, probably have a round of golf or two with them from time to time, and surely have moved beyond the occasional meeting at a fundraiser or dinner party. Bottom line: Judge Henry Hudson is a well-connected player in the Republican party. Just what the party machine ordered. A well-oiled judge to smooth the way for what is a planned assault on any legislation that benefits people rather than corporations.